Weather works against your driveway or parking lot. This is why it is important to keep up with your asphalt sealcoating. But, maintaing your gutters can also help extend the life of your blacktop. 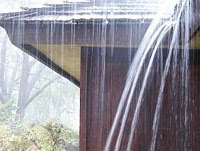 Keeping you gutters clean or installing gutters can extend the life of your driveway and your driveway sealcoating. Water constantly dripping on the same spot will prematurely erode your driveway in that area. The dripping water will act as a drill bit and bore a hole in your driveway or parking lot. If you would like to request a free estimate please fill out the form located here. Or contact us by phone.